You may have heard the term “hostage loads” in regards to moving companies. It occurs when the company that you hired refuses to unload the truck unless you pay them more money. This situation can cause much stress in addition to the stress of moving day. The good news is that it is now illegal in Arizona. House Bill 2145, championed by the Attorney General Mark Brnovich offers protection to Arizona residents. Residents will no longer be forced to pay more than the agreed-upon price to move their goods, thus avoiding hostage loads. In order to avoid hiring one of the Arizona moving companies that could try to hold your belongings hostage, it is important to research your moving company as early as possible before the move. Get recommendations from friends and family and take the time to explore reputable movers. You might want to check their license and registration as well as verify that the company is registered with the Arizona Corporation Commission. For interstate moves, the government has provided this helpful information. One of the important steps that you can take before the move is to ask about all the charges involved, so you will know beforehand. If you decide to use a broker, remember that you have no control over who that moving broker chooses to handle your possessions. On moving day, be sure to be present to make sure that nothing is left behind and to be sure the company has directions to your new location. Have adequate insurance in case there is damage to your possessions during the move. Read any documents carefully before signing them. On the day of delivery, be there to pay the mover and check your belongings against the inventory list. Carefully check that you have all items before signing the list. To avoid being the victim of hostage loads, you must do your homework and select a licensed and established local moving company to ensure that your move goes smoothly. If you have any questions about hosting loads, please contact the moving experts at Arizona Discount Movers. We look forward to helping you with your move as you begin your exciting adventure in your new home. It’s safe to say that moving is not high on anyone’s list of fun things to do. Without proper preparation, and without the proper moving company, your moving day could turn out to be a stress filled waste of time, energy and money. Thinking of moving yourself? Unless your move is very small, here are a few important points to consider prior to committing to a do-it-yourself move. Preparation and the move itself usually happen after work hours. Let’s face it, today’s stressful work demands, and schedules leave us little time for family and healthful outside interests… let alone time to orchestrate and execute a full-blown move. Moving yourself will still cost you money. You’ve filled your home with things to enjoy…you won’t enjoy moving or damaging them. Expect damaged furniture and damaged property when you move yourself. The truth is, you find out who your friends are on moving day when your friend hires a moving company and don’t call you for help. That’s a true friend! Moving by an unprofessional is inherently dangerous. Moving yourself can be dangerous to your furniture, property, vehicles and dangerous to you and your family/friends physical and mental well-being. Now that it’s clear you need a professional moving company, it’s imperative to do the proper research to insure you are hiring an established and reputable moving company. Listed below are numerous important points relative to securing such a moving company. Research online reviews and ratings. Start with My Guy Referrals, BBB, Home Advisor, Angies List or other reputable sites. Confirm valid USDOT and MC numbers. Are the employees drug tested, E-Verified and on the payroll? Confirm that they are not contract or temporary service workers and are not paid under the table. Does the company operate under one name, or a variety of names? Is their hourly rate competitive? Beware of low prices that are too good to be true. Usually a low price is a red flag for additional fees… which may be hidden. Example: A Customer receives a quote from a local moving company for 3-men at $79 per hour, but after the hidden 22% fuel surcharge is applied the actual hourly rate turns out to be $96 per hour! Ask if there are ANY additional fees. Extra unsaid fees may be applied for use of tape, shrink-wrap, padding, stairs, etc. Fees may be applied for items such as pianos, appliances, exercise equipment, bicycles, patio furniture and any other item deemed a “specialty item”. These can add up quickly! OK, now that you’ve done your due diligence and secured a moving company, let’s touch on some of the common mistakes to avoid before and during your move. Now is the time to begin getting ready for your move. Remember… your procrastination should not be the moving company’s emergency. Being unprepared on move day will add time, frustration and expense. Moving is stressful and doubly so for pets! Try to maintain a routine as normal as possible to prevent uneasiness and stress on your pets. Also, a trip to the vet, prior to the move, is good time to update booster shots and needed medications. Not having small items packed. Loose unboxed items, also known as chowder, command extra time to move and waste valuable space on the moving truck. Anything not boxed cannot be stacked efficiently or safely and is susceptible to damage. Not closing and taping boxes. Unclosed boxes tend to be overfilled, which prevents efficient or safe stacking, which renders them susceptible to damage. Don’t forget to label the sides of your packed boxes, in case they are stacked. Label boxes according to room and label each of the rooms door to coincide. Color coding with colored tape works as well. Not emptying the refrigerator and freezer. Allow 24 hours for the emptied refrigerator and freezer to thaw/drain property. Not packing a necessities bag. Pack a bag filled with necessities for post move survival. Include basic toiletries, medicines, toilet paper, soap, pet food, a flashlight, basic tools etc. If the truck arrives late or the move goes late, you’ll be glad you have such a bag. Not having boxes and items down from the attic. For liability purposes, movers refrain from climbing ladders or pulldown stairways. Be sure to retrieve your belongings from the attic prior to your move. Some basic tips to prepare for your move and packing will provide you a clearer path to a smooth and uneventful moving experience. Clearly label and inventory all Packed by Owner Boxes (PBO’s). Be sure they are closed and securely taped shut. Place heavier items in small boxes and lighter objects in larger boxes. Small 1.5 cu/ft -books, magazines, papers, files etc. Medium 3.0 cu/ft -clothes, toys, shoes, misc. Large 4.5 cu/ft -towels, linens, blankets, pillow covers etc. Extra Large 6.0 cu/ft -assorted large non-heavy items. Dish Pack 5.0 cu/ft -glassware, vases, dishes, fragile items. Use liberal amounts of packing paper and/or bubble wrap. Pack plates and saucers on their side. Let the movers know beforehand if they need to pack for you. Unless the moving company has pre-arranged to pack you, they may not have any packing supplies, or enough movers, on the truck. Do not obstruct the mover’s pathways with packed boxes. Unhook all electronics to be moved. reassembling at the new residence. Backup your computer before the move. As moving is not ideal for electronics, make copies of documents or scan them to the cloud. Keep the important documents, like tax returns, marriage and birth certificates, medical cards in a lockbox or other secure container to be taken with you. Small, light items such as jewelry, coins, watches, medicine bottles, collectables, small electronic devices, etc. Take jewelry boxes with you or empty them out. Flammables and hazardous materials are not allowed to be transported on moving vehicles. Always check with your moving company beforehand to verify. Aerosols, ammonia ammunition, batteries, bleach, car batteries, charcoal, lighter fluid, chemistry sets, cleaning solvents, darkroom chemicals, explosives, fertilizer, firearms, fire extinguishers, fireworks, fuels and oils, gasoline, hard liquor, kerosene, lamp oil, bleach, oxygen tanks, matches, paint thinner, nail polish remover, paints, pesticides, poisons, pool chemicals, propane tanks, sterno, weed killer. Most moving companies refrain from transporting live house plants or outdoor plants, and if they do move them it’s with a waiver to release them of liability. Live plants will not survive a trip onboard a closed moving van in the Arizona heat. Pots and vases, which are subject to prolonged moisture and weight from the dirt, become fragile. Cactus are inherently dangerous to the movers and are not transported at all. Washers, dryers and refrigerators oh my! Be sure to unhook your washer, dryer and refrigerator for the move. If the moving company agrees to disconnect or hook up appliances it’s with a customer signed waiver to release them of liability from potential leaks. Valves and pipes may be compromised, due to old age, etc., which could cause them to leak and damage walls and floors. Pianos, pool tables, spas, large tools, gun safes, etc. may warrant special fees or extra movers to move. Not all moving companies handle specialty items, so be sure to inquire when researching your move. New customers enjoy more savings when bundling services! Need storage and moving? Receive first month’s storage FREE and 10% off total move cost when you do both with us. Call today! 15 FREE boxes with pack-n-move. 5% off for seniors and our military! Top Ten Moving Company in Arizona! 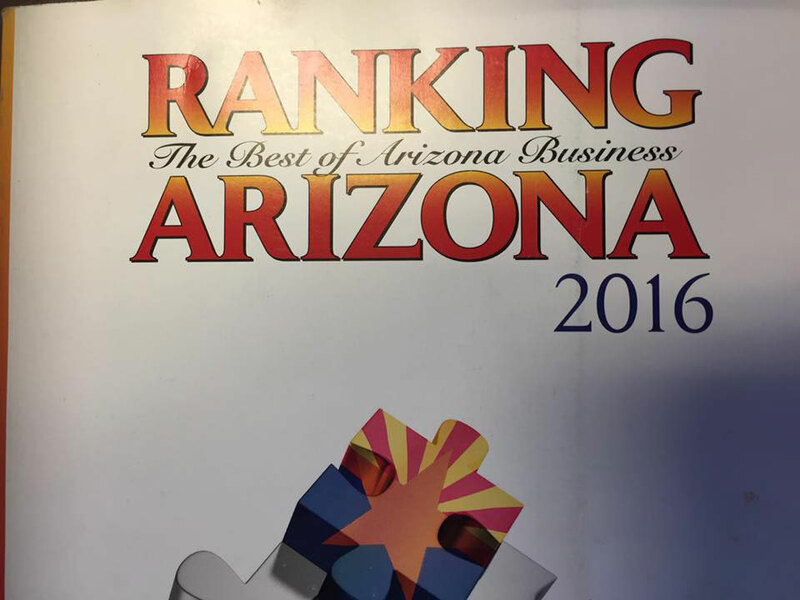 We are very excited to find out our company Arizona Discount Movers made it to the top ten Best of Arizona Business In Arizona 2016!! Out of hundreds of moving companies… Congratulations to all the moving companies who made this list!